Science Based Cuisine: Thai. Hot? 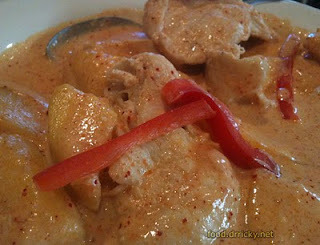 I had initially read a blog write up about the mango curry over at Khun Kay Thai (KKT) on Montrose, and was intrigued by the idea. I imagined a curry that marries the herbaceous complexity of Thai cooking with the punchy sweetness of chutney, a novel use of fruit in a savory preparation. What I did get was little more than somewhat overcooked white chicken meat (why do restaurants keep using this? ), bathed in coconut-based curry sauce, with some ripe mango chunks thrown in. The sauce itself was rich in texture, and certainly peppery with cayenne, but lacked the depth and balance of flavors in good Southeast Asian cooking. 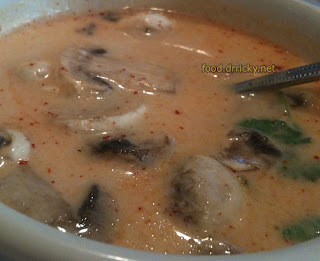 I also ordered what I consider to be a good barometer of Thai cooking: the coconut based soup called tom kha gai. Well, in this case, the gai part is optional: KKT allows you to choose different proteins to go into the soup.The soup base has the herbaceous tones of lemongrass, but lacked the funk of galangal and fish sauce. The mushrooms floating in it are nearly raw white button mushrooms instead of the slippery straw mushrooms, and the capsaicin burn of the soup is also raw, and poorly integrated, as if it was sprinkled on last minute. And I think I hit upon what bothers me about the food here. It's deconstruction gone wrong. Much of the beauty of Southeast Asian cooking, particularly when it comes to curries and soups, is in the symphonic combination of flavors, from salty to sweet, sour and spicy, to produce a melange that greater than the sum of its parts. What I see here is a restaurant caught between a vision of good Thai cooking and conforming to the skittish palates of the rapidly gentrifying and yuppifying neighborhood. We asked about som tum, and was told that they would love to serve it, but it's too unpopular. While people often write about modulating the heat of Thai cooking, there's a lot more it that flavor profile than heat - the tang of keffir lime, the brace of ginger, and it fits into the backdrop of coconut richness. In trying to appeal to the squeaky wheel, I fear that KKT's execution of Thai food lacks soul and vision.